OK I have two questions. First one is. Which is better Medicare or Medicaid. And the other question is as follows. Is my job provide insurance better than any of latter. I’m on an union and the insurance kicks in after 90 days. That’s in about two weeks. I currently have Medicaid. Even though I haven’t used it. Should I keep it or take the union insurance plan. I don’t know anything about either insurance plans and could use the advise. Thank you. We know how confusing this can be. So, first I’ll explain the difference between Medicare and Medicaid. Medicare is for those over 65, and those under 65 with certain disabilities. Medicaid is for those who qualify based off financial needs. And, you can have both at the same time. When your union insurance kicks in, you may have to take it. You will have to contact your union and Medicaid to confirm this. If you need private health insurance (Medigap or an Obamacare plan) please call one of our licensed independent insurance agents at 800-930-7956. Most times if you have Medicare and Medicaid, you will be enrolled in a Medicare Advantage Special Needs Plan. What this means for you is: while Original Medicare covers your hospice care (if needed), all other services are “replaced” into a small, local Medicare Advantage network. It’s not so much that you need it, but it makes the plan more affordable for the government if you’re enrolled in a plan with a small network and a managed care system that requires a primary care physician who is the gatekeeper for your care. Hope this helps! Thanks so much for this! I had never heard of an EPO before. Does a PPO pay more toward your care? Thanks for your question. 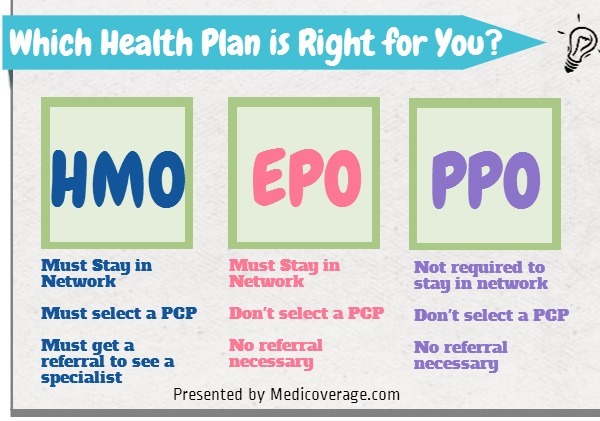 If you were to choose an EPO, HMO, or PPO at the same metal level, each should cover you at the same overall percentage of cost. Each plan or provider, however, may choose to break down their costs differently by network. For instance, if you are hospitalized, an HMO may have a set per day cost, whereas a PPO may charge a percentage of your total cost. To learn specific plan cost breakdowns give us a call.